I have never read an anthology quite like this one! 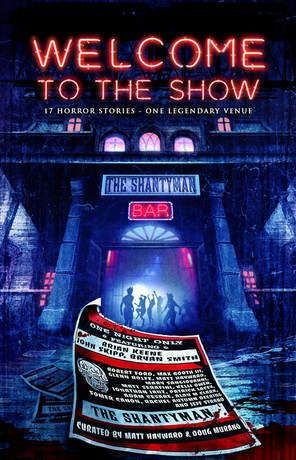 It contains 17 horror stories with one legendary venue. The cover grabs you by the short hairs and pulls you in. You can hear the music pouring out into the streets. You can smell the drugs and alcohol in the air. The Shantyman is the place to be. It has everything you need. This review will be spoiler free and synopsis free. I love a themed anthology! I love music! These stories contain everything you could possibly want from an anthology. From the first story to the last, this eclectic anthology stays strong. There isn’t a bad story in the lot. WELCOME TO THE SHOW melts your face off. Some stories rip your face off, while others hit you right in the chest with an axe. Demons, monsters, other dimensions, and human sacrifice fill these pages. I have yet to see a more impressive line-up of authors in an anthology. GUTTED was my favorite anthology until I read this one. Each story brings something new and exciting to the table. I thought there would be at least one slow or boring story in the bunch, but there wasn’t. I couldn’t just stop at just one story. I had to devour this anthology completely in one bite. From the story arrangement to the editing, WELCOME TO THE SHOW is amazing! If I had to make a prediction, then I would say this anthology will win a Bram Stoker Award. WELCOME TO THE SHOW has the music and the scares. I can’t wait to get my hands on a physical copy! Crystal Lake Publishing keeps pumping out great anthologies and collections! You should check them out!